We all know what it means to be thirsty - that annoying sensation of dryness in the mouth and throat caused by the lack of fluids followed by that desire to drink. From this sensation it seems that people of almost any language use the word ‘thirst’ as a synonym for a strong desire or craving for whatever the object, like a thirst for knowledge, or a thirst for wealth. Clearly, because of the obvious analogies, thirst is a prominent theme of the Bible. In fact, “thirst” is a word loaded with figurative meaning in scriptures. The hot and dry desert climate of most parts of Palestine must have given the word ‘thirst’ an intensified meaning. Maintaining an adequate water supply for human and animal consumption, as well as for agriculture, was in biblical times a perennial problem. Thirst was a frequent and occasionally life-threatening concern. More importantly, the word is a powerful means of communicating a profoundly deep spiritual truth. An intriguing aspect of today's story is how Jesus turned the tables on the Samaritan woman by using the analogy of thirst, water and its source, as a way of entering into a spiritual conversation with the woman. Jesus appears on the scene, apparently thirsty, asking for a drink. Pause for a moment to take that in - Jesus thirsts – also one of the last words he utters from the cross. It is consoling to note that God thirsts for us, for our liberation and our salvation. But the story soon ironically evolves into a tale that focuses on the unquenchable thirst of the woman, a thirst that cannot be sated by her unending search for love, acceptance, spirituality, and faith. This would only be possible with Christ. At one juncture of this long conversation, Jesus would asked the woman: "If you knew the gift of God, and who it is that is saying to you, 'Give me a drink,' you would have asked him, and he would have given you living water'. The Samaritan woman’s response to Jesus is filled with sarcasm and incredulity, 'Sir, you have no bucket and the well is deep. Where do you get that living water?' Jesus is unperturbed and replies. 'Everyone who drinks of this water will be thirsty again, but those who drink of the water that I will give them will never be thirsty.' Who could refuse a promise like this, especially the prospect of not having to lug home a heavy bucket of water from the village well? It is no surprise that she then softens and finally concedes, 'Sir, give me this water.” Did she really understand what she was asking? The depth of the well is a good starting point to speak of the gravity of the spiritual thirst of the Samaritan woman and that of every soul. In the ensuing debate of which is the greater shrine, the Samaritan one built close to the site of the historical well or the Jerusalem Temple - the Samaritan woman argues the preeminence of Samaritan site by praising the greatness of Jacob, the giver of the well. As far the Samaritans were concerned that well contained holy water, because historically identified with the ancestor of her race – their national hero. But irony is apparent once again. If we would run a contest for the most passionate and thirsty individual of the Old Testament, Jacob will make the top three. Who else cheats his brother and father for destiny, works fourteen years for the woman he loves, wins a wrestle match with the Angel of the Lord and procreates the nation that delivers the Messiah? Only one guy can brag about that… Jacob. But then Jacob’s well is unable to solve the ‘unquenchable thirst’ of the Samaritan woman, indeed of every souls. Jacob’s well is a picture of the waters of this world. It speaks of every natural pleasure and ‘painkiller’ for the soul ever invented. Be it the best of technology, political ideology, entertainment, immorality, humanism and religion. The waters of this world cannot quench the profound thirst of the human heart. Quoting Jesus ‘whoever drinks of this water will thirst again’. In 2011, Pope Benedict addressed a crowd of a half million young people in Sydney, Australia, on the occasion of the World Youth Day. He was keenly aware of the spiritual thirst of the many souls gathered there, some who had travelled long distance to catch a glimpse of the Pope, many fuelled by curiosity and the perennial thirst for an answer to life’s mysteries. Pope Benedict spoke them and told them that "in so many of our societies, side by side with material prosperity, a spiritual desert is spreading: an interior emptiness, an unnamed fear, a quiet sense of despair. How many of our contemporaries have built broken and empty cisterns (cf. Jer 2:13) in a desperate search for meaning?" No doubt about it, our wells are indeed deep! The great catechist then identified the things we are thirsting for: love that endures, opportunity to share gifts, unity based on truth, communion that respects the freedom of the other person. These can be summed up as thirst or longing for three things: goodness, beauty and truth, the three transcendentals. But, said the Holy Father, instead of goodness, beauty and truth what our society offers is choice, novelty and subjective experience. Those things are not bad in themselves, but to stop there is like substituting the authentic goldmine for a poor imitation. God created man with the capacity to worship Him and the need to be in fellowship with Him. Science fiction writer, H. G. Wells, writes that every person has a “God-shaped vacuum in his heart - a void that only God can fill.” Indeed, we humans are enfleshed yearning. Our yearning is infinite, because we have been created with a hole in our hearts, in the shape of God and nothing, absolutely nothing, can fill it up except God himself. St. Augustine put it this way, “My soul is restless ‘till it rests in Thee.” As you all know, the life of Augustine is a replay of the life of our gospel’s protagonist, the Samaritan Woman. Behind Augustine is a succession of desperate searches for fulfillment: excessive pleasures, false religions, philosophies, dissipation and distractions—futilities that left him so weary of himself. At the very moment when his yearning led him to desperation, circumstances led his eyes to a passage in Scripture – to the one thing, no, to the one person who could heal his weariness and satisfy his longing thirst, Christ. 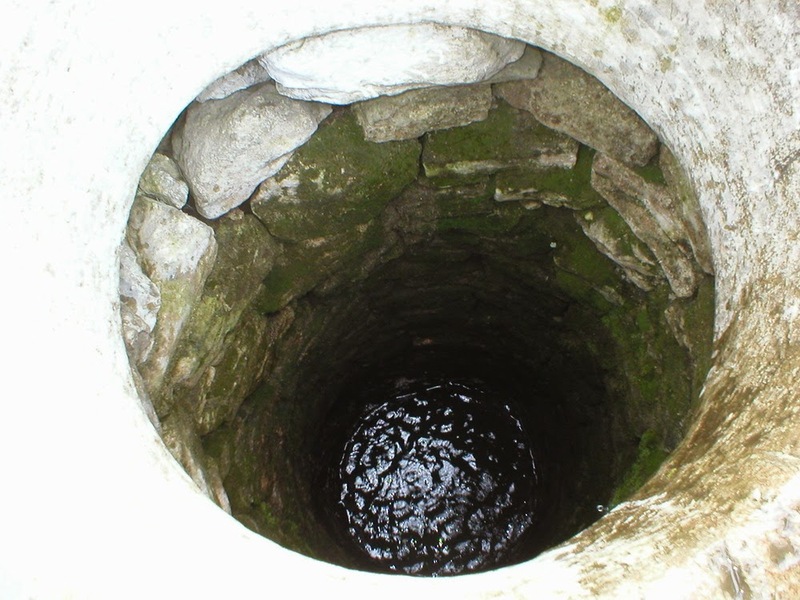 The depth of the well proves a challenge to anyone who has no recourse to a rope and a bucket. It was certainly unimaginable that one could reach the water source and have access to its bountiful supply without some form of human machination. Therefore, the well becomes a most suitable symbol of the human soul. But the good news is that the well also symbolises the unfathomable depths of God’s love. And so buried deep within us is this spiritual aquifer – it is the place of deep communion between God’s spirit and ours. It lies hidden beneath layers of superficiality, our preoccupations with all things material and tangible, our dalliance with world delights and pursuits, our ambition for power and mastery. Though too deep for us, our wells are never too deep for Him. And when we are prepared to come on our bended knees, stripped of all pretenses of superiority or confident self-reliance, we stoop over the well—yes, often in our very darkest night of mystery and sadness—lo! the heavenly light reappears—we see the lost star of Providence mirrored in the fountain of salvation. We only have to ask, “Master, give me this water,” we are assured of a drink from the well of God’s immense riches which promises life and immortality. Thereafter, we shall never be thirsty again.